As we prepare to head into Fall, soups are coming back into season. 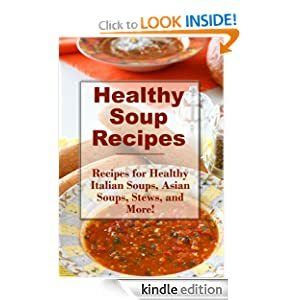 Amp up your repertoire with the FREE eCookbook Healthy Soup Recipes: Healthy Stews, Asian Soups, Italian Soups, and More - Kindle Edition. Download the book for free from Amazon to your Kindle, iPad, iPhone, PC or other compatible device. You can download a FREE Kindle app for your Web Browser, PC, Mac, iPhone, iPad, BlackBerry, or Android Phone. Keep in mind that while the book is free right now, the price may change at any time.